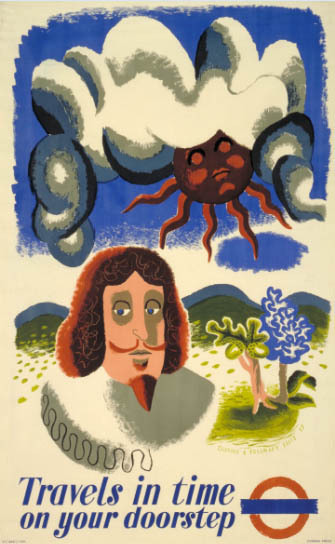 This week’s poster is actually a pair of posters – Travels in Time on Your Doorstep and Travels in Space on Your Doorstep by Clifford Ellis and Rosemary Ellis, created in 1937 during the height of the Surrealist movement. This movement began in the early 1920s and encouraged the creative potential of the subconscious in all areas of the arts and literature, with visual art commonly appearing as a juxtaposition of imagery with the logic of reason removed. In keeping with this ethos, these posters promoted the use of public transport in a more ambiguous than literal fashion. Surrealist art in advertising was a more subtle and indirect form of publicity and was adopted in a range of mainstream campaigns from fuel and transport providers to watch makers. Other notable works from this period within the Museum’s collection include those by English artist Graham Sutherland and prolific American artist Man Ray. It is worthwhile to note that across the Channel, during the same period, the famed Spanish Surrealist Salvador Dali was producing advertising for the French railways. 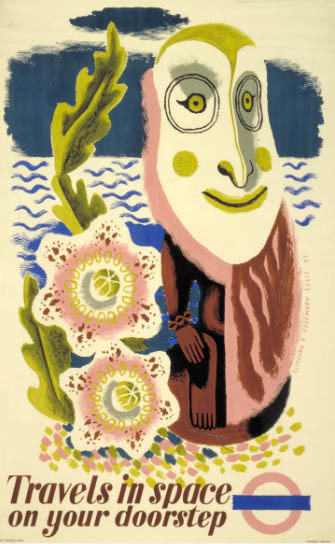 The illustrators of this particular set of posters, Clifford and Rosemary Ellis, were a husband and wife team who produced a number of posters for London Transport during the 1930s, as well as for Shell and the General Post Office. They also designed many book covers and worked for the Bath Academy of Art, an institution established to educate art teachers. We were reminded of these posters while working on our new show Project X, an immersive theatrical adventure based on time travel! We don’t want to give too much away, but it involves the solving of cryptic clues and a finale that incorporates a time travel portal! And as with all our Posters of the Week, prints are available to buy in a range of sizes and with optional framing from our online shop.